Panasonic is showing off a prototype of a 4K micro four thirds format interchangeable lens camera. 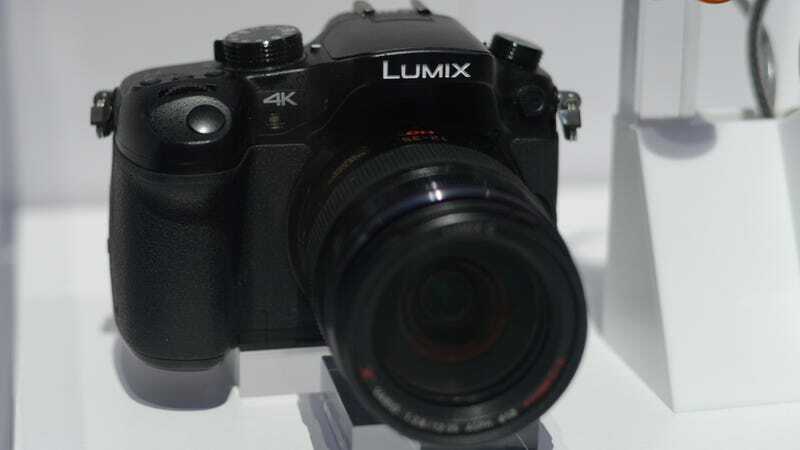 It looks just like Panasonic's video-chomping GH3. We don't know much about the forthcoming protoype, but we're told that it's more than wankery and that we'll see a product in the near future. Panasonic is showing a prototype of a SDXC speed class 3 card for use with the camera. It's rated at a minimum transfer rate of 30MB/S so it can handle all the data that 4K entails. Additionally, Panasonic had a live demo of a working prototype of its forthcoming wearable 4K camera. The mock up looks identical to the existing A100 point-of-view wearable recorder that currently shoots only 1080p video. Now that that 4K televisions seem almost unstoppable you should expect to see more and more of these consumer and non-pro cameras popping up with 4K powers. And that's a good thing, because if we're gonna have 4k TVs, we might as well have widely available cameras that amateurs and low-budget filmmakers can use to make 4K content. Panny had the camera set up pointing at people visiting the exhibit at its CES booth, and the feed was displayed on a 4K Tv. We don't know what fancy tricks might have been going behind the scenes, but the footage looked very good for a feed coming from such a small camera. The video had significant vignetting from the fisheye lens on the camera, but it was very smooth and otherwise distortion and noise free as far as I could tell.